Eps 81 - Bergamo The Crusher VS Son Goku! Which One Wields The Limitless Power?! Eps 82 - Never Forgive Son Goku! Toppo The Warrior Of Justice Intrudes!! Eps 83 - Form the Universe 7 Representing Team! Who are the Strongest Ten?! Eps 86 - Fists Cross For The First Time! Android #17 Vs Son Goku!! Eps 87 - Hunt The Poachers! Goku And No. 17's United Front!! 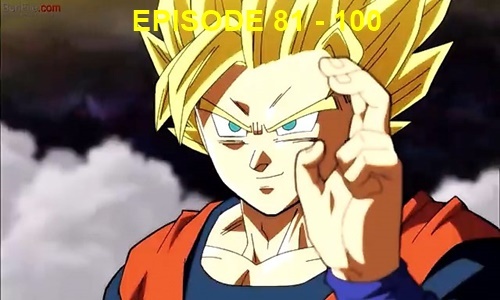 Eps 88 - Gohan And Piccolo Teacher And Pupil Clash In Max Training! Eps 93 - You're The Tenth Warrior! Goku Goes To See Frieza!! Eps 94 - The Emperor of Evil Returns! A Reception of Mysterious Assassins?! Eps 95 - The Worst! The Most evil! Frieza's Rampage!! Eps 96 - The Time Is Here! To The World Of Void For The Fate Of The Universe!! Eps 97 - Survive! The Tournament of Power Begins at Last!! Eps 98 - Oh, Uncertainty! A Universe Despairs!! Eps 99 - Show Them! Krillin's True Power!! Eps 100 - Out Of Control! The Savage Berserker Awakens! !